Description: NS Westbound Local Freight Train T81 rumbles through Decatur, Al. Description: Standing on the old Jersey Central main I lensed H75 performing some local work at Lehighton. 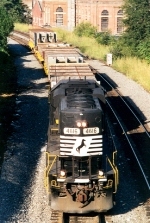 Description: NS 5016 is on the point of H-47 at LongswampTwp, Pa 3/2005. Description: The LEHL goes solar with PROTEC RAIL's friction management system. Description: best viewed by right clicking and clicking " view image"
Description: Main Street, 1212 hours. Description: On the Black River & Western, Main Street, 1230 hours.